Expresso® is a software-as-a-service application that embodies the NIST 7 step process for performing a HIPAA Risk Assessment. Expresso® is included in our Subscription Plan with a 30 day $$ money back guarantee! Designed by a renown HIPAA Lawyer, Expresso® comes pre-populated with Threats, Vulnerabilities, and potential business Impacts to your organization making the calculation of Risks easier. You can modify all pre-populated data in a manner that best fits your organization and obviously add new Threats and Vulnerabilities. 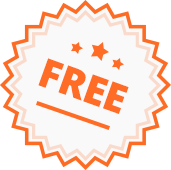 Get FREE Visible Demonstrable Training! Watch this video to learn about our Compliance Challenge! Are you struggling with HIPAA/HITECH compliance? With the HIPAA Survival Guide Subscription Plan, you can implement, or update your HIPAA compliance initiative with ease. 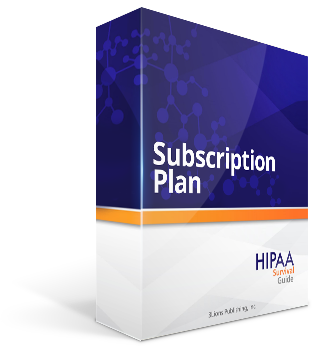 The HIPAA Survival Guide Subscription Plan provides step-by-step guidance to make it easier for you to start or enhance your compliance initiative. The Subscription Plan includes all of the tools, templates, checklists and model policies you might need to bring your business into full compliance. 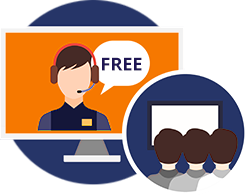 Our Subscription Plan provides you on-demand access to all our products and our library of previously recorded webinars. Looking for a model Business Associate contract? The HIPAA Survival Guide Subscription Plan contains both a covered entity-to-business associate model contract and a business associate-to-business associate model contract that you can modify to suit your company’s needs. The Subscription Plan also contains annotated contracts that point you directly to the regulatory basis for specific terms and conditions. Thousands of customers have already used the comprehensive set of products in our Subscription Plan to help them comply and stay current with the HIPAA Rules. The HIPAA Survival Guide has helped educate us as to what we need to do. We are now well on the path to telling a better compliance story through the documentation and processes we have put in place. Hipaa Survival Guide is exactly what we were searching for. It has all the documentation we need to create a culture of compliance at our company. Ted Swanson, CEO/CFO - IT Solutions Consulting, Inc.
HSG’s materials are great resources for anyone interested in HIPAA/ HITECH compliance. They’re excellent educational materials for those just starting out, and detailed enough to be tremendous assets to those who are actually implementing a program. HSG’s products are clear and practical, and provide unique insights and perspectives not easily found elsewhere. Michael Walsh - MD Dallas, Texas. With the HIPAA Survival Guide Subscription Plan you will have a comprehensive set of training modules with over 30 hours of video. Each module comes with a Quiz and Answer key to measure staff results. Having an out-of-box training program that may be repeatedly reused for groups or individuals can significantly drive down your training costs. The HIPAA Survival Guide Subscription Plan also contains a virtual library of pre-recorded webinars for the life of your subscription. Included in these recordings is our subscribers only “How to Survive a HIPAA Audit” set of webinars that provide comprehensive audit preparation coverage unmatched anywhere else. We provide subscribers the ingredients and the recipe needed to respond to even the toughest audit questions. How do we keep track of everything? The HIPAA Survival Guide Subscription Plan comes with a comprehensive set of tools and templates that let you track your compliance initiative over time. We provide a Model Security Incident document, a spreadsheet to track Security Incidents, Model Breach Notification letters, User's Guides, Risk Assessment spreadsheets, a Training Tracking spreadsheet and so much more. The HIPAA Survival Guide Subscription Plan also comes with a detailed set of 19 project plans that provide easy to understand tasks your compliance team can execute on day one. Our methodology, tools, templates and project plans eliminate “analysis / paralysis” because they are broken down into readily digestible “chunks” of tasks that are self-explanatory. We continue to deliver proven compliance solutions—with the release of Expresso™ we are taking our Subscription Plan to another level. Expresso™ delivers on the promise of Risk Assessments that are easy to understand and to execute. We eliminate the tedious task of matching Threats with Vulnerabilities by abstracting this complexity away with our pre-populated data. Covered Entities and Business Associates can now more effectively focus on reducing risks to levels that are “reasonable and appropriate” instead of getting “lost in the weeds” in the complex language of cybersecurity. Stay Up to Date with the latest HIPAA news! Every month our CEO hosts a FREE webinar on a variety of HIPAA topics that you wouldn't want to miss. Anyone can attend live, but only subscribers have exclusive access to our on-demand library of recorded webinars! Once you subscribe, you will have immediate online access to all of the Subscription Plan Products and webinars. This is an annual plan with optional renewal at a discounted rate. Sign up to receive our FREE monthly Newsletter and Download a FREE HIPAA Survival Guide 4th Edition and FREE Visible Demonstrable Training! Both should provide you with insight into our high-quality content.